Pak Han-Yong&apos;s day is here. An elite hacker with Unit 101 of the North Korean military, he&apos;s labored for years to launch Project Sonnimne: a series of deadly viruses set to cripple Imperialist infrastructure. Brendan Chogan isn&apos;t a hero. He&apos;s an out-of-work parking enforcement officer and one-time collegiate boxer trying to support his wife and children. But now there&apos;s a foreign enemy on the shore, a blackout that extends across America, and an unseen menace targeting him. Strangers whose survival depends upon each other&apos;s skills and courage. For fans of Tom Clancy, ALL SYSTEMS DOWN is a riveting cyber war thriller which presents a threat so credible you&apos;ll be questioning reality. The scary part of this novel is the story line is entirely possible. There is no Plan B for the USA. Author Sam Boush describes the sequence of events following THE WORST “What If” event in today’s computerized world. It’s not a “What if”- it’s happening in real time to Navy fighter jock launched from a carrier they can no longer communicate with in an aircraft with its systems failing. It’s happening to a family struggling to hold together as the city around panics and drops into mob rule. Imagine watching as each electronic device in the USA fails in a cascading sequence of bad to worse. Every electronic device, from a Smart watch to a jumbo airliner fails. It’s no biggie if your watch stops, unless you’re at 30,000 ft in a computer chip based airliner shutting down. DOWN is the operative word. Satellites fall from the sky. Motorized traffic grinds to a STOP. The President issues a warning as the TV Channels fail. A TOTAL Blackout across the USA. The cyber collapse is the prelude to a military attack by Far East forces. In a last ditch effort, the Dept. of Defense recruits a Cyber expert, Xandra Strandlien, to ride in an old Cessna prop aircraft WITHOUT modern electronics still flying in the Cyber collapse. Her job is to get to Portland and try to infiltrate an enemy computer and insert a US counter-cyber attack in their software. In Portland, she encounters a group of unlikely heroes, fighting random mobs and Russian forces to stay together. Oh, did I mention without computer-based controls, all the nuclear power plants in the US a slowly going critical as a prelude to a Chernobyl-type explosion and meltdown. Can it get any worse?? YES! The Russians have sent a submarine up the Columbia River to Portland as a prelude to a military landing in the city. The heroes are normal people (with the exception of 2 trained Navy flight crew) trying to do their best in a “Mission Impossible” situation. It’s a good tale (No spoilers here) and contains enough reality to make you believe we are one malware bug away from a Cyber War. 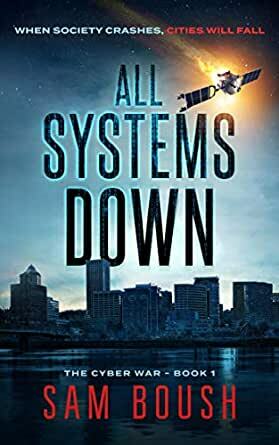 “All Systems Down”, Sam Boush’s novel of a devastating cyber attack and its very human consequences, should make you think. We rely on the Internet and goods manufactured with imported electronics so heavily in our modern world that the thought of a rogue state manipulating these to our detriment is one we tend to push away from our conscious mind. Yet, as we have seen recently, nation states do engage in cyberwarfare, and they do it to covertly promote their own agendas over what we believe we are choosing freely. I used to work in a field where these scenarios became part of my everyday considerations. I spoke with governments, industry and military clients about the realities of cyber attacks. Most of the time the reaction was akin to ‘oh, that sounds like science fiction’. They were wrong back then; they are wrong today. I guess I was just preaching twenty years too soon. When I started reading Boush’s thriller, all the nightmares came rushing back. The events in his story did not feel in any way exaggerated or overblown. He does an outstanding job of creating a very believable scenario, which serves as the backdrop for a tense thriller centred on the human consequences of a major cyber offensive. And it is the human element that is the standout in this tale. A very diverse group of individuals, normal people with normal jobs and normal lives, centres the attention of the reader on the very real consequences of the global incidents described. The way each of these reacts, as society breaks down at an alarming rate, creates a tension and pace that has the reader rushing toward a finale which is at once optimistic and fearful. A great reading discovery. Don’t miss this one if you like exciting techothrillers that will keep you up at night and have you thinking for weeks afterwards. We've all experienced internet outages, and just being without for hours seems like the end of the world. Imagine that being forever... We had a snow storm that dropped so much snow that it took days to dig out and left us with no power for three days. Very hard to deal with! Again, imagine that on a more permanent basis. The beginnings of this story felt a lot like that. Though this is fiction, it does read as if it could happen. I don't believe that our systems are quite that weak, to be taken over so easily. Especially the military side of things. I bet in reality, there would be some smouldering spots on the face of the earth after something like this. Still, a very good read, even though the ending was a little far-fetched. Would have been nice to read more about what happened to those countries involved in this. Yes, I'll admit I'm a fan of the book “One Second After” by William Forstchen, where the reader follows one family, and the town they live in, through the ordeal of what life would be like after an EMP event. But “All Systems Down” is a different read. It’s a cyber tech thriller that introduces you to a cast of characters attempting to navigate through the first chaotic days after our country is brought to its knees by a coordinated attack on our power grid and technology. It then sets the stage for a future series of stories featuring this unlikely group as they band together to survive. This was a quick read for me. The author kept me turning the pages. Honestly, I would’ve enjoyed it more if the novel was a bit longer. It felt a little rushed at the end. But I'm definitely interested in reading the next book when it arrives.